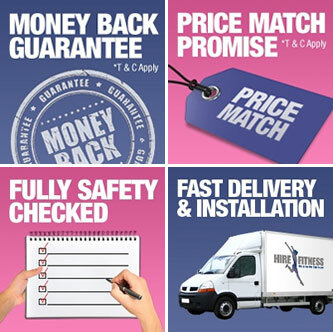 Hire Fitness Dublin has been operating since 2008, supplying homes and businesses with gym quality fitness equipment for short term or long term hire periods. We look forward to helping you achieve your fitness goals, so please do give us a call or drop us a line and we'll assist you in any way we can. We will deliver and install nationwide, within 24-48 hours of receiving your request. Everyone wants to achieve fitness. Whether we hope to improve our physique for aesthetic reasons, or we simply want to work on our body for the sake of bettering our health, improving your physical fitness is a great goal to aspire to. However, what many people fail to recognize, is that achieving that goal doesn’t have to be done according to a one-size-fits-all manuscript. Although attending weekly or daily sessions at a local gym may be the ideal solution for some, others will find that joining a gym doesn’t work for them. Instead of looking for other options, these people tend to love hope, and their good intentions becoming overshadowed by a sense of guilt as they struggle to enjoy trips to the gym, cannot make enough time for regular appointments, or find that other commitments cause their visits to diminish. There is another way. Hire Fitness, in Dublin, provides consumers with the opportunity to bring the gym to them, for use whenever they want it. Once you have chosen the machine that is right for you, all you have to do is order the equipment online, call us on 1890 987876 or email at [email protected], and you could be setting up in no time, with delivery within 48 hours of ordering, or sooner. The delivery team that brings your equipment will also set it up in the room of your choice, and as they have full expertise on every piece, they will be able to give you comprehensive information in response to any questions that you may have on controls, or how to operate a machine. If you’re not sure which piece of equipment will be the right one to meet your particular needs, then through Hire Fitness Dublin, you can try and test different pieces for as little as four weeks, with the assistance of added guidance provided by our trained professionals. We recognize that regular exercise and physical fitness are essential components of a healthy lifestyle, and that family commitments, lack of suitable facilities, and time constraints, should not get in the way of your health. If you find that a piece of equipment is not right for you, or get bored and want to try something else, simply provide a week’s notice, and we will arrange a date to collect it. No hassle needed. Hire Fitness, is Ireland’s premium supplier when it comes to providing high-quality fitness equipment. At Hire Fitness in Dublin, we are proud of our ability to provide customers with an unbeatable quality of service, and a fantastic range of fitness equipment, whether the machines are needed for group, club, commercial, work, or home use. · Endurance and strength: Weights and a bench can be the best option for individuals searching to improve their overall strength. · Accessories and mats: If you have a great deal of space to play with, then accessories and a supplied matted area can be useful as a space to warm up or cool down, as well as incorporating stretching activities into your exercise routine. · Cardio exercise: Cardio equipment tends to be the heart of gym equipment, including rowing machines, elliptical cross trainers, exercise bikes and treadmills.